“We are sucking our aquifers dry,” the headline reads. Could this be a good thing? The bad effects of declining groundwater levels are known: land subsidence, the cost of pumping from deeper wells, the drying up of surface springs and streams. But there is a potential gain as well. Using up one resource, the water stored under the ground, we are creating another: storage space far greater than any conceivable new dam could provide. “Historical overdraft,” writes engineer Jay Lund, “may be an effective means of underground reservoir construction.” If so, we have been building like mad. Of course a reservoir, to be of any use, has to work both ways: it must fill when water is plentiful in order to be emptied when it is not. So far we have been much better at emptying than filling. Under last year’s Sustainable Groundwater Management Act, we are finally getting organized to control chronic depletion. A few in the water world are asking a further question: If the rains come back, can we not only stabilize these banks but fill them up again, buying ourselves insurance against droughts, maybe much worse ones, to come? At first glance the thought is compelling. We use, in cities and on farms, some 35 to 40 million acre-feet of water a year. The reservoirs behind dams can hold something less than 50 MAF, basically a year’s supply. But the porous deposits of sand and gravel that underlie much of the state originally contained at least a billion acre-feet of water. Of this we have so far removed 150 MAF or more. The depleted zone alone could hold at least three times as much water as surface reservoirs; drilling still deeper could theoretically not only harvest more water but also open more storage space. Zone 7’s new lake near Livermore, part of a plan to recharge the region’s groundwater basin and wells. Photo courtesy Carol Mahoney. To judge the real potential we have to ask two additional questions: just where is this empty aquifer capacity, and where would we find the water to fill it? Let’s start where the groundwater balance is best understood and least troubling. The aquifers in several large urban water districts along the coast and in the Inland Empire of Southern California have long been managed as storehouses for wet-year and imported water. These reserves have been drawn down now, but not to crisis levels. One Bay Area example is the Zone 7 Water Agency in the Livermore Valley, where the local aquifer is slightly fuller this year than last. “We’re in pretty good shape so far,” says Engineering Manager Jarnail Chahal. 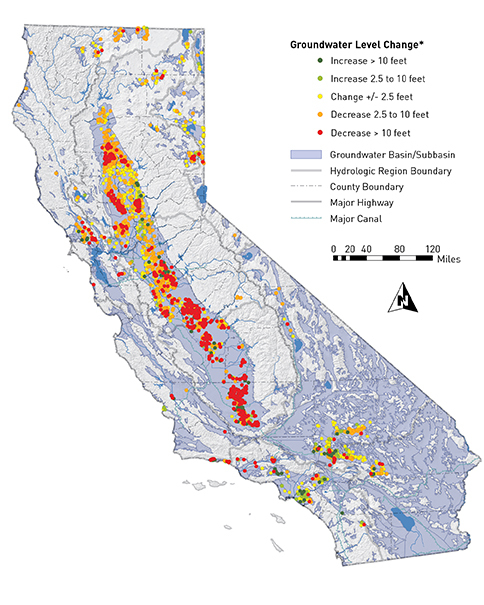 Of course the water cached in these aquifers has come largely from long distance imports—from the Sierra Nevada, from the Delta—and these may prove less and less reliable in a drought-prone future. 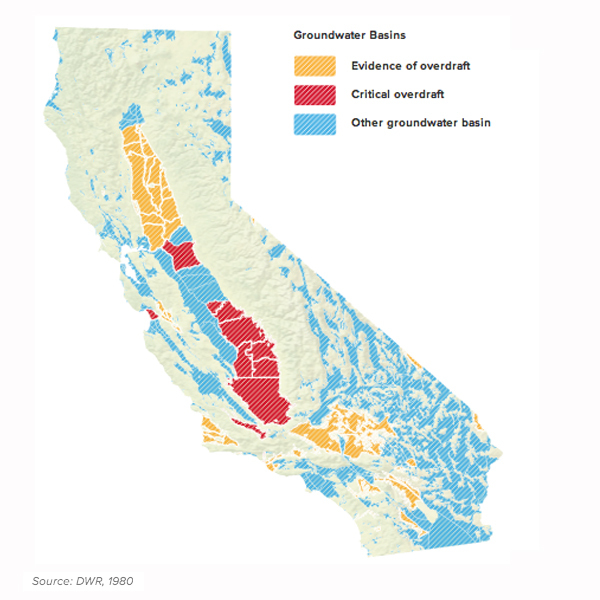 To increase supply security, managers are looking to amp up groundwater recharge from strictly local sources. the agencies are looking to capture them, spread them, and cache them underground. Above all this means opening more recharge areas. Zone 7 is acquiring old quarry pits. In Southern California, the concrete bottoms of flood control channels are being opened up to reconnect surface flows to aquifers below. “Flood management is drought management,” says State Water Resources Control Board member Steven Moore. Floods are now and then. A never failing source of local recharge is the water we have already used. Public resistance may still bar the way to simply reintroducing highly treated wastewater to the mains, but mixing it in with the vast stock in an aquifer serves even better for water supply. “What aquifers offer urban areas is storage for recycled water,” says Peter Vorster, hydrogeographer for the Bay Institute. Southern California is decades ahead of the north in making use of this resource. Water recycling, stormwater capture, aquifer management, along with ordinary conservation, make a package so potent that at least one urban district in Southern California is planning to wean itself from long-distance water imports, taking in “project water,” for recharge purposes, only in the wettest years. In certain cases, water autonomy seems almost within reach. When we talk of aquifer depletion, though, we are really thinking of the vast sedimentary beds underlying the Central Valley, the agricultural heartland. Their condition varies. To the north of the Delta, Sacramento Valley aquifers are, even today, relatively full. To the south, in the San Joaquin Valley, the empty spaces proliferate. If these underground vacancies are to be turned into assets on a major scale, this is where it has to occur. refill. The lesser one, though quite big enough, is the chaotic state of most attempts to manage California’s groundwater. The greater one is geography. Much of the Valley floor is covered by irrigation districts that serve water from reservoirs, streams, or aqueducts to their customers, mostly farms. In wet years, farmers use more district water, allowing underground water tables to rise. In drier years, when surface flows are less plentiful, they rely more on wells. This more-or-less automatic alternation sounds like a formula for balance, but often it hasn’t been. Decade by decade, in many districts, total pumping has outrun total recharge, with the usual nasty results. Matters are worse in the “white spaces,” large areas of the Valley that have no surface water input and are not organized in districts at all. Though water is legally a public resource, water in the ground has always been treated as the property of the overlying landowner. Without regulation, the incentive is to pump and pump, extracting water before the next farm gets it. These swathes of the Wild Water West account for much more than their share of the depletion that is ringing alarm bells today. Semitropic junction pumping plant where both ground and surface water can be redirected according to water banking agreements. Photo SWSD. At the other extreme, some water districts have repurposed themselves as “water banks,” tracking deposits and withdrawals rigorously. Some of these serve local agriculture only; others contract with distant urban customers, renting out storage space. The oldest of these operations is the Semitropic Water Storage District north of Bakersfield, which serves not only 140,000 acres of farmland but also a group of distant “banking partners,” including Zone 7, the Santa Clara Valley Water Agency, and the Metropolitan Water District of Southern California. In wet years, when the State Water Project deliveries are generous, Semitropic distributes these to its farmers and lets the underground lake swell through natural recharge and irrigation seepage. In dry years it switches its farmers to groundwater, letting its distant partners take some, or all, of the allotted Semitropic aqueduct share. Even in the current drought, water levels remain rather high. Our dry spell also shows the limitations of this system. While Semitropic can feed banked water into the southward-flowing aqueduct, there is no physical mechanism for getting it north, “upstream.” The exchange water the northern partners are supposed to get instead may simply be unavailable when aqueduct deliveries are near zero — as they were last year. 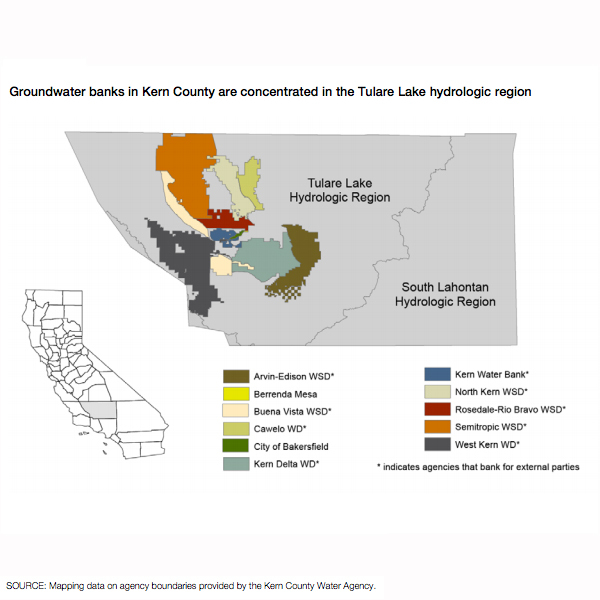 Groundwater isn’t governed by the lines on maps that separate water banks from irrigation districts and both from anarchic “white spaces.” It flows to where the pumping is. One manager’s prudent practice can be sabotaged by unrestrained extraction next door. Under the new Sustainable Groundwater Management Act, the free-for-all is supposed to come to a gradual end. In this future not-so-wild water west, can the total volume of water stored in Central Valley aquifers actually increase over time? Here’s where geography takes over. at the southern end of the San Joaquin Valley. Sitting just north of the Tehachapis and metropolitan Southern California, traversed by the California Aqueduct and the Friant-Kern canal, the basin might seem like a logical water depot for the whole state. And indeed the important Kern County water banks are here. But expansion of this function seems unlikely. The accumulated overdraft is huge, and the amounts of water that might be conserved in flood years or added from the north (via imports from the Delta or from a proposed new dam on the San Joaquin) are not large enough even to stop the bleeding. Only a shrinkage of agriculture can do that. 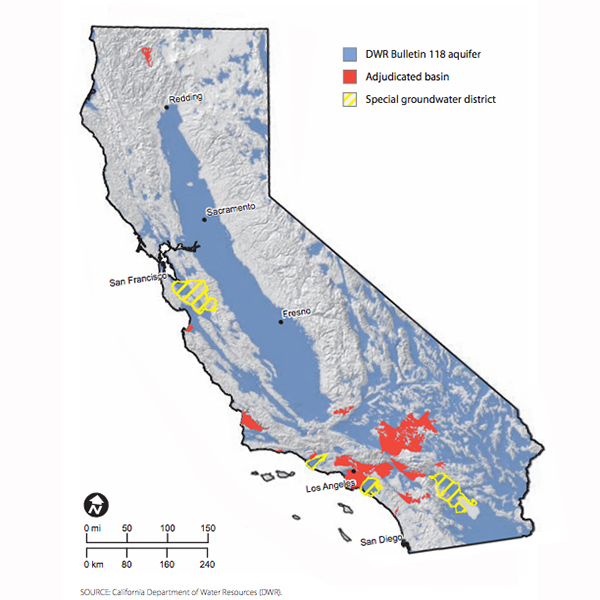 Richard Matteis of the California Farm Bureau, which opposed the new groundwater law, laments that reaching balance will require the retirement of at least half a million acres of farmland. What is left will be devoted more and more to high-value crops, like the debated and delicious almond. The picture is more hopeful in the next region north, the central area watered by the San Joaquin and its tributaries. Here there are both empty spaces underground and wet-year runoff to fill them. To complicate matters, however, this region is rather short on another essential resource: suitable recharge zones. The ones that exist all need to be pressed into service. The best candidates are riverbeds, floodplains, and fallowed or dormant fields. Restoration flows released into dry section of San Joaquin River below Gravelly Ford in April 2010, a river reach where aquifer recharge can top 70 thousand acre feet per year. Photo courtesy The Bay Institute. The slowly progressing attempt to restore the San Joaquin River can be seen as an aquifer recharge project. When the dry middle section of the river was rewatered on an interim basis in 2009, it took several months for surface flow to make it through; most of the water released was going underground. Though the drought has delayed the next steps in recovery, recharge of the riverside aquifer goes on. There is more water in the ground and otherwise available to farmers today, says Peter Vorster, than there would have been without the restoration program. Given that a river is flowing, the next recharge step is to give it back its flood plain, undoing the old-fashioned channelization that hustles valuable peak flows seaward. A Nature Conservancy project on the Cosumnes River found that pulling back dikes one thousand feet allowed even modest runoff surges to spread — and sink into the ground. Bay Municipal Utility District toward a much larger project that may use both fallow fields and dormant vineyards as winter spreading zones. The Authority’s Brandon Nakagawa agrees: “This opens a lot of doors for us,” he says. than to fill it. Water tables near streams should always be kept high, says Maurice Hall, until recently a water resources scientist with The Nature Conservancy. “This avoids further loss of surface flows and supports stream-side vegetation.” But zones well away from stream courses might be tapped and then managed more aggressively, yielding and receiving water according to weather cycles. all the regions. First, aquifers must be kept clean. Much attention has been paid of late to contamination by “produced water,” the millions of contaminated gallons that come up with oil and are disposed of by being pumped underground again. Rather less fuss has been made about pollution by nitrates sinking in from the surface, especially under feedlots and dairy farms. Second, water recycling matters here as well. Treated municipal wastewater is already used for irrigation and recharge; that troublesome oil field water might also be purified. Let’s say all these things, and a few others, were done. How much storage might we actually gain? In a paper published last November, a group at the U. C. Davis Center for Watershed Studies tackled this question head on. The results, under the title “Integrating Storage in California’s Changing Water System,” were promising but sobering. 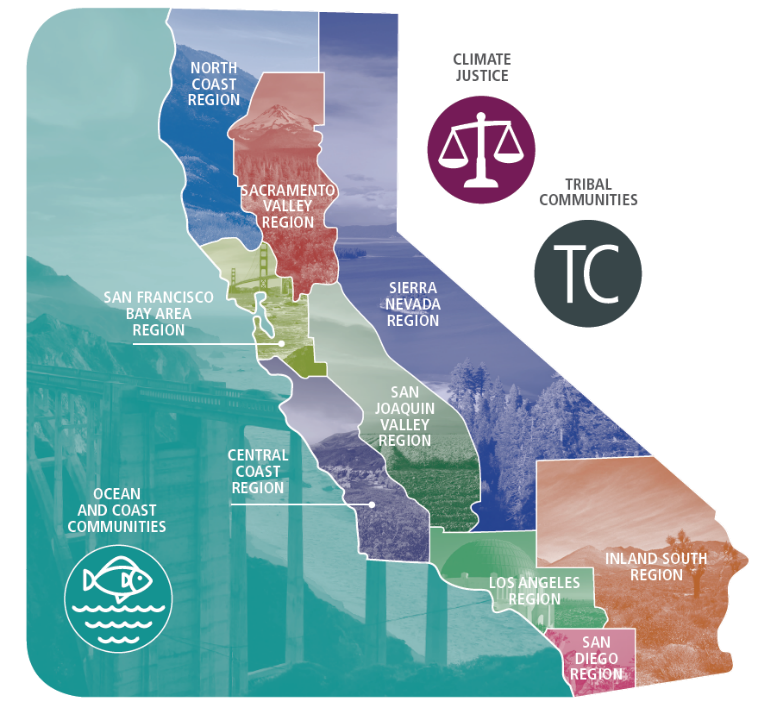 “At most,” the authors concluded, “California’s large-scale water system could utilize up to 5-6 MAF of additional . . . storage capacity,” whether behind dams or underground. Runoff is simply not sufficient, based on historical fluctuations, to fill more. Six or so MAF of storage capacity is not to be sneered at. It could be extremely valuable. If it were underground, as favored by most experts, it would amount to at least a doubling of managed aquifer space. If utilized correctly, it could definitely help us ride out multi-year droughts like the one we are currently enduring. 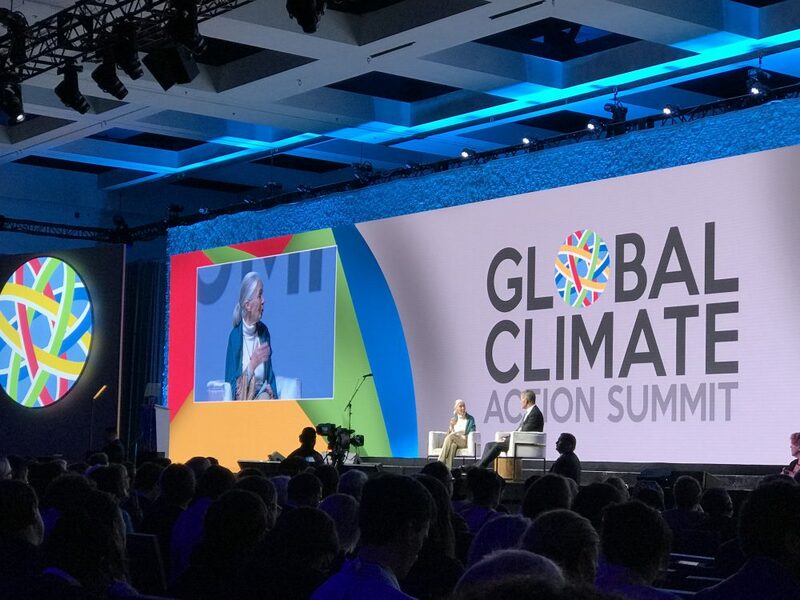 What it would not provide, the authors make clear, is long-term insurance against droughts worse than those we’ve seen. Never mind global warming: We needn’t go back too many centuries to find evidence of such droughts. There are drowned trees in the beds of Tenaya Lake and Mono Lake — trees that began as seeds at a time when the lakes were shrunken, and had time to sprout and reach full size before the waters rose again. The work of geomorphologist and paleoclimatologist Scott Stine and others suggests medieval dry periods that lasted a century or two. In 2011, a group of researchers including Stine and Jay Lund tried to model the effects of a drought lasting 72 years in which precipitation never exceeded half the historical norm. In a drought of that length, without wet interludes, all reserves would be exhausted. The state would be forced to live on its year-to-year water income. The key to economic survival in such a situation, the modelers conclude, is a free-wheeling market system in which water flows to whatever user could pay most for it. Cities would have little trouble coping. Agriculture would make large adjustments, abandoning most of its lower-value crops and contracting overall. The real loser, in this trial run, would be the Bay Delta estuary, fish, and the environment in general. The river flows that are currently mandated would either be impossible to maintain or so costly that there would be great pressure to cut them back (see Scapefish, ESTUARY NEWS June 2015). This research used CALVIN, “an economic-engineering optimization model for the entire water system of California.” CALVIN has its baked-in assumptions, its limits, and its critics. But no one seems to challenge the essence of this result. A really long drought would make California a different place from the one we think we know. To continue Cain’s analogy, it is tough to pad a savings account when you’re spending more than your income, most of the time. We have been doing that, in water terms, not for months or years, but for many decades. Stopping groundwater overdraft means using less water, at least in many places, and with sometimes painful results. Reversing it, even on a large scale, is possible. But it can only happen if we use less water still. 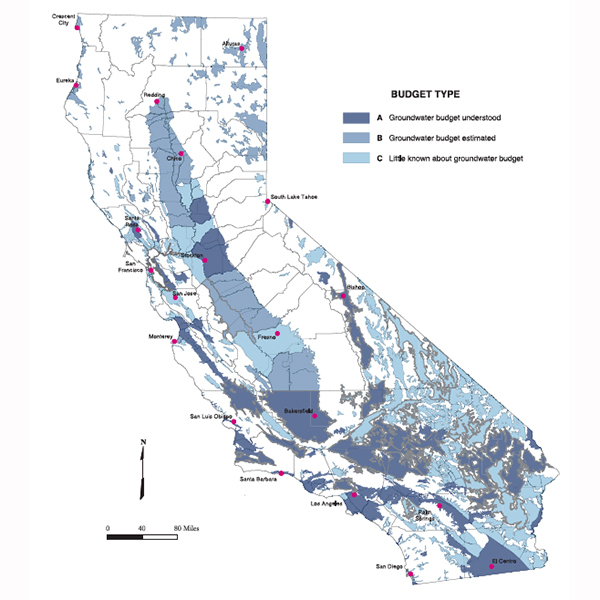 Maps depicting various aspects of the aquifer management and groundwater banking situation in California. Map 2 of 6 (above) is groundwater level change between spring 2010 and spring 2014 as determined from water level measurements in wells and based on available data from the DWR Water Data Library as of 11/08/2014 (DWR Public Update for Drought Response).